More than ever before, individuals like us can help drive forward our transition to clean energy. We have the power to stand up, speak up, and make smart choices—in how we power our homes, cars, schools, cities—and so much more. 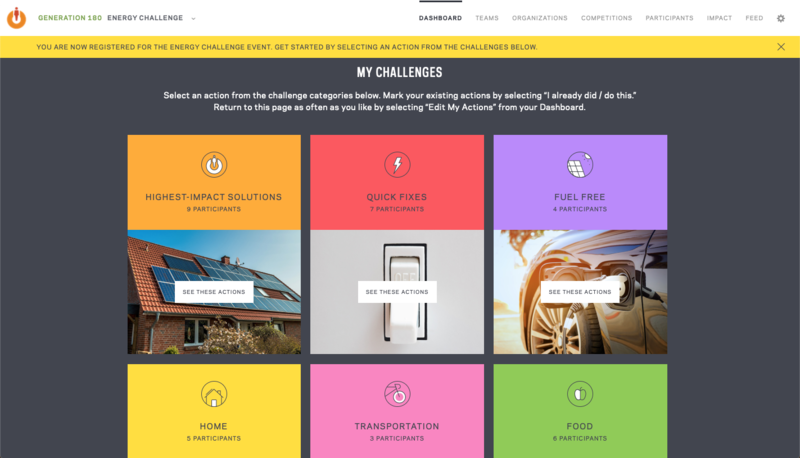 We’ve just launched our Energy Challenge to make it simpler and easier to take everyday action in your own life. Here are ten strategies to help you get started with the Energy Challenge, maximize the power of this tool, and take action on clean energy. The duration of your challenge matters. Spend some time thinking about the length of your ideal challenge before you get going. With a shorter challenge period (~1 month), you can aim for rapid change by making a strong push in a relatively small amount of time. Alternatively, longer challenge periods (~3 months) allow you to go at a slower pace and can be helpful in taking on deeper lifestyle changes and planning for some of the actions that take more time and attention, like rooftop solar. Assess your goals for the Energy Challenge and choose a challenge period that helps you achieve them. We’re all in this together! Inspire and empower your inner circle to take part in the clean energy transition, and help them realize their carbon and financial savings in the process. Collectively, individuals account for approximately one-third of U.S. greenhouse gas emissions through their personal vehicles and home energy use, so the collective savings of your team could be huge. Besides, energy action is more fun with friends, family, and colleagues, so create your own team or join an existing team today! There’s no better motivator than a little healthy competition. In the Energy Challenge, you earn points for all the actions you take, and you can compete with other teams and within your own team to see who can earn the most! Use the built-in feature that allows teams to challenge other teams head-to-head; check out the overall leaderboard to see how your team stacks up to others in the platform; or track your progress internally through your personal team leaderboard. Take some time to browse through the list of actions. The actions span different levels of difficulty, and there are options in nearly every aspect of your daily life, whether it’s home energy use, transportation, or even food choices. Start with the ones that best fit your current lifestyle. Then, think outside the box. Challenge yourself to take action in ways you would have never thought possible. Be the spark—disrupt the norm around how we think about and use energy in our everyday lives, and then inspire others to do the same. Shifting the status quo can take some work. Set some reminders on your phone, calendar, agenda, etc. to remind you of the everyday actions you’re going to take. The platform will even send you a few automated reminders and tips to help you along. People say that it takes three weeks for an action to become a habit, so until that point, it can’t hurt to set a few reminders to prompt you toward clean energy action. Some of these actions require a big commitment, and can’t all be done at once. Set clear, reasonable, actionable, and time-constrained goals to pave the way toward completing the highest-impact actions (and consequently, racking up a ton of points for the Challenge). For example, there are a few different actions you can take toward getting solar or an electric vehicle, and each of them will earn you points. Careful and thoughtful planning is sure to result in a successful and impactful challenge, so get started and plan it out today. 7. Find something you’re passionate about—and share it! Empowerment is contagious, so make sure to share the progress you’re making in the Energy Challenge. The platform allows you to post to a discussion feed to show other participants how you’re taking action and to inspire them to take their own, or you can even ask for help in solving a problem you encounter on your own. Sharing a real experience or obstacle can catalyze widespread action and give you the support you need to keep making progress in the Energy Challenge. 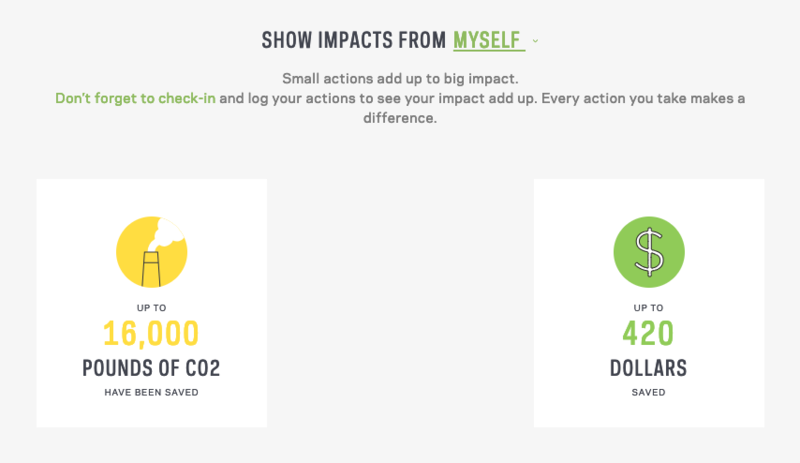 For some of the actions, the Energy Challenge provides calculations of the average financial and greenhouse gas savings attributed to those actions to help participants visualize how much of an impact they’re making. Each individual situation is unique. Take a look at how much you’re saving on your grocery bill by adopting a plant-rich diet, or see how much carbon-free clean electricity rooftop solar panels could produce. Gain points by customizing your profile, interacting with others, and making the challenge a part of your life. Fully embracing the challenge’s customization capabilities and choosing actions that speak to you will enable you to get the most out of the Challenge. Dive into the settings page and distinguish yourself (and your impact) from others’ to make your efforts known. We all need to rise to the challenge in order to make the collective impact we need. That’s why we’re working closely with organizations and groups to bring them on board the Energy Challenge en masse. So, if you are part of a larger company, volunteer group, or any other community that wants to expand its social impact, we can help. The Energy Challenge provides a simple, measurable, and fun way for large groups to take action toward a clean energy future together, building a collaborative and sustainable culture among participants. Please reach out to us to learn more. You're now fully-equipped to tackle The Energy Challenge. See you on the platform!